Hello. Thanks for calling by. All Kiwis love 'outdoor living', and whenever the sun is shining, we can be found out on the deck, in the garden, around the pool, or cooking on the barbecue. Landscaping helps us make better use of our outdoor spaces, and trellis is an ideal way to define living areas, providing fencing, screening, windbreaks and / or shade, or garden features such as gates, archways, or even pergolas. However, we also experience different climatic conditions throughout the year, so our 'outdoor living' areas have to be able to withstand the toughest weather conditions that New Zealand has to offer. At Heavy Duty Trellis, we understand this, and so have developed the toughest, most durable trellis products on the market, designed to resist the toughest weather conditions and extremes. Season after season, after season. Find out what makes our products different. What makes our product different to others? Over 10 years of experience, development and refinement means we are confident that Heavy Duty Trellis is built tough enough to withstand virtually everything that New Zealand can throw at it. Central Otago experiences some of the coldest winters, and hottest summer peak temperatures in the country. With temperature variations of between -12 c and in excess of 37 c, our own backyard has proven to be an excellent proving ground. 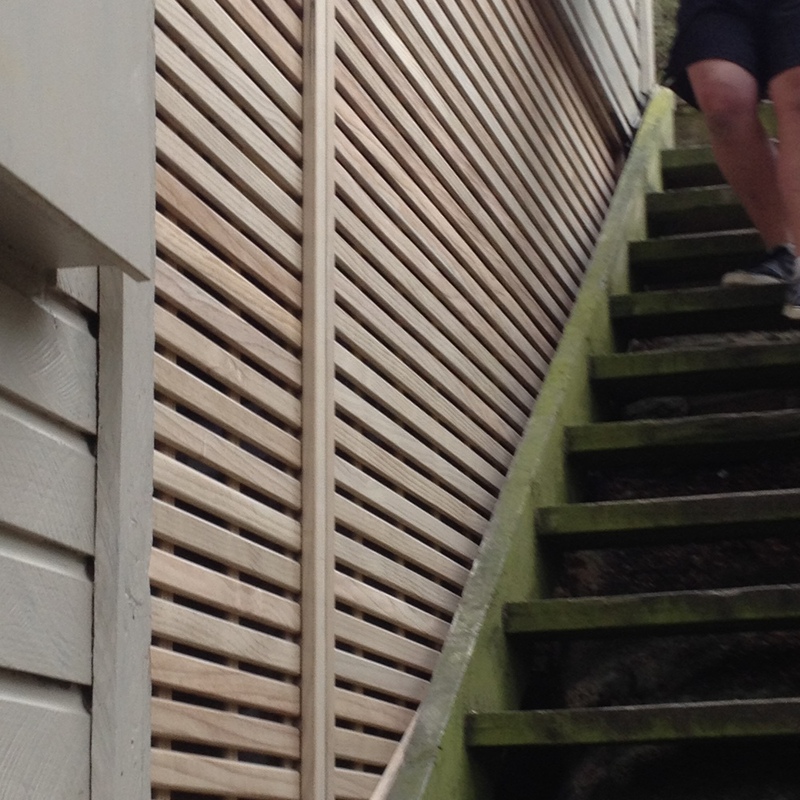 Our customer base also extends out to coastal communities, where high winds, rain and salty air can also provide challenges to outdoor timber landscaping products. Strong, thick framing (70mm x 45mm). Batten (42mm x 12mm) with rounded edges to reduce warping and splitting. All frame corners and trellis securing points are screwed together. Frame corners now have dowel pins for extra strength and stability. Our timber is H3 treated No 2 clears, pine* all locally sourced, in natural finish (standard). Can be supplied pre-stained or painted to order. High quality stainless screws are used throughout our products to provide maximum durability in the wet, and rust resistance in salty air environments. 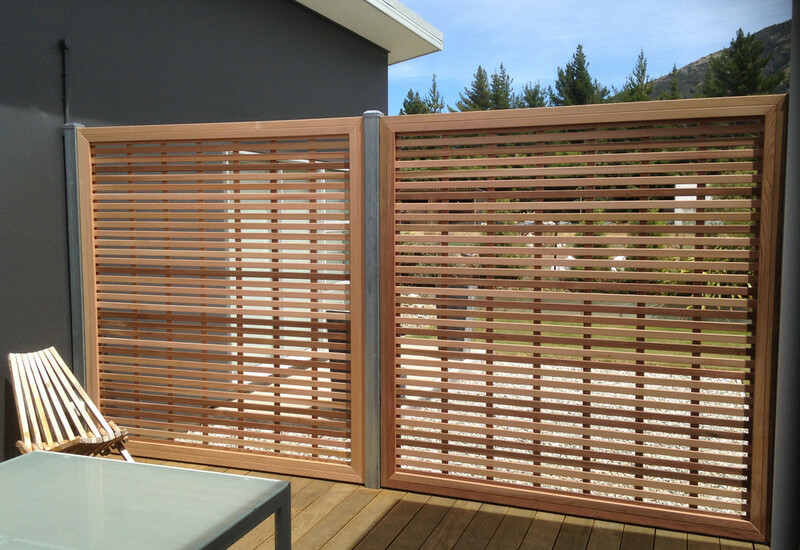 Louvred trellis panels are now extremely popular for screening and pergolas. Each louvre is mounted into routed joints for maximum strength. Our trellis battens are secured with diversion point staples, and in line with our ongoing research and development, stainless steel versions of these staples will be standard across all of our product range from 2016.
or alternatively, and at your request, we will come out to your place, measure up and quote the job, design, manufacture, and then install. Our full offering also includes providing posts*, any other fixings, and labour. *We recommend and use laminated fence posts because although our trellis will not move, twist or warp, standard fence posts will, and this can create problems and put undue strain on all trellis components. Laminated posts are more expensive to buy, but combined with the rigidity of our trellis, they remove the need for (and cost of), top and bottom rails. People say that the proof of the pudding is in the eating. This is what just some of our clients have had to say about us. — Greg and Anne, Wanaka. — Peter and Robyn, Cromwell.